Discovered by: Robert M. Horowitz, T. A. Geissman in 1950 (DOI). 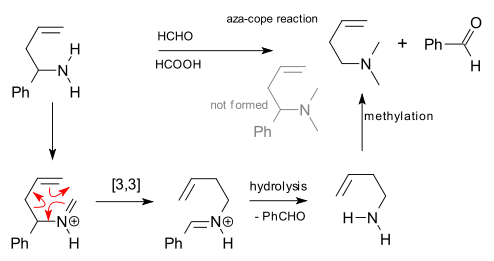 Reaction of 1-allylbenzylamine with formic acid and formic acid did not yield the expected 1-allylbenzyldimethylamine (the result of methylation) but benzaldehyde and 1-dimethylamino-3-butene. Mechanism: Addition of formaldehyde to the starting amine gives an iminium ion which reacts in a sigmatropic reaction to another rearranged iminium ion (but stabilized by the phenyl group). Hydrolysis splits of the benzaldehyde unit and the final step is methylation. This rearrangement reaction generally takes place at lower temperatures then the Cope reaction but still high. Catalysis is possible with Lewis acid (BF3, ZnCl2) and protic acid (HCl).